Let the world know about your retreat program(s) and/or your retreat facilities. Place your retreat profile in this central World Directory so that interested individuals and groups can find their way to you. 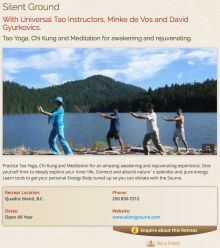 FREE INTRODUCTORY SUBSCRIPTION: 4 months free for undated retreats (retreat locations). Pay only Setup and Posting fees. For registration on mobile, please email info@retreatsonline.com. OR: Subscribe by the month: $8 per calendar month; same setup and posting fees. OR: Subscribe by the month: $16 per calendar month; same setup and posting fees. 7 Subject categories, 5 photos with text. Featured rotations on our home page. OR: Subscribe by the month: $21 per calendar month; same setup and posting fees. REPEATS, date change only - pay only the Posting fee, within the time frame of your Subscription. Keep it short! Lengthy text does not necessarily get more visitors to your own website. should be LANDSCAPE FORMAT (approx. 5 wide by 3 high works well), no faces, text or other critical information near the edges where there is risk of cut-off. 'Retreats For Sale' Package: same rates. Used for selling retreat real estate property. *Note: Landscape format (approx. ratio 4 wide by 3 high), at least 1000 pixels wide, works best. *Note: This text will be placed below Image 1. We recommend no more than 100 words. *Note: This text will be placed below Image 2. We recommend no more than 50 words. *Note: This text will be placed below Image 3. We recommend no more than 50 words. *Note: This text will be placed below Image 4. We recommend no more than 50 words. *Note: This text will be placed below Image 5. We recommend no more than 50 words.